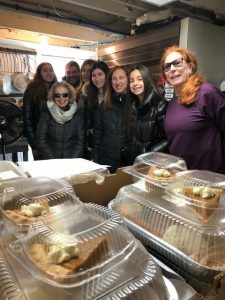 The Westport Woman’s Club sponsors holiday meals each Thanksgiving Day for local homebound residents, in support of Westport’s Department of Human Services’ home-delivered meal clients, who may not otherwise have family or friends to share the holiday. These 2018 Thanksgiving meals were prepared by In Good Taste Catering, and were delivered by many appreciated volunteers. Pictured in Photo: bottom left, Leah Scherzer from the Westport Woman’s Club; Volunteers from the National Charity League; and far right, Cris Negron of In Good Taste Catering.